We specialize in producing some of the finest wildlife mounts in Central Texas. Whether you need full body mount, a custom tanned hide or a simple antler mount, we can provide you with results of the highest caliber. 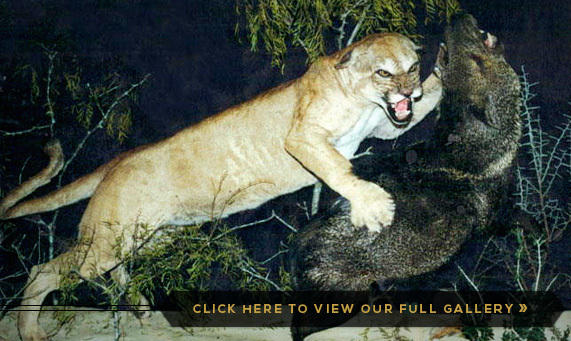 With decades of experience, we can take on virtually any taxidermy service you might imagine. PLEASE E-MAIL US OR CALL (512) 259-4902. Taxidermy services include: basic economical and premium custom sculpted shoulder mounts, freshwater and saltwater fish skin mounts and replicas, custom mounts with habitat and prey, lifelike action-posed bird mounts both flying and standing including upland game birds and waterfowl, European skull mounts on hanger plaques or custom bases, antler and horn mounts on hardwood plaques, soft tanned hides, skins and furs, flat and open mouth rugs with borders and backing, repairs of existing taxidermy work with prompt delivery and novelty work of all types. © 2013 Professional Taxidermy Studio. All rights reserved. After hours and weekends by appointment. We're happy to work around your schedule.